Taking the scenic route to 1 million Mueller retired from Ford in 2000. In the six years leading up to his retirement, he worked as many overtime hours as he could while developing plans to travel North America. He invested the money in stocks with hopes to earn even more on his savings. Then, the market crashed and Mueller lost 70 percent of his “fun money.” His travel dreams seemed to be dead. A sliver of hope came to him one day, however, at a fast food restaurant. He bumped into a relative who told him about a friend who was seeing the country on the cheap by towing large recreational vehicle campers, or RVs, and delivering them to buyers. liter Power Stroke® diesel V8 that has been his companion ever since. Mueller travels between 600 and 800 miles most days and has been to 48 states and seven provinces in Canada. He doesn’t know how many RVs he has hauled over the years but said he has hauled about 40 through the first four months of 2011.
capability enables Mueller to constantly haul the large RVs and sets Ford apart from competitors. Truck delivers RVs – and fuel efficiency Mueller said that his F-350 Super Duty gets about 20 mpg when delivering RVs – a crucial number to him since he is responsible for most of the expenses. With its 7.3-liter Power Stroke diesel, Mueller’s truck is equipped with the first generation of the Power Stroke engine, available between 1994 and 2002. It produces 275 horsepower and 520 lb.-ft. of torque. 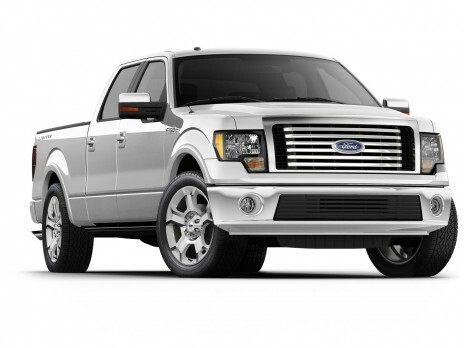 By comparison, the fourth-generation Power Stroke diesel – the 6.7-liter version introduced in the 2011 F-Series Super Duty – produces 400 horsepower and a whopping 800 lb.-ft. of torque. Among the features of the prior generation engine in Mueller’s truck are direct injection and turbocharging, which help deliver improved fuel economy with the high torque required of a powerful tow vehicle. The 2011 Super Duty with the all-new 6.7-liter Power Stroke diesel engine has further refined fuel injection turbocharging technology for even higher levels of efficiency. Mueller said his driving habits also contribute to the outstanding gas mileage. He avoids fast starts and stops. If weather conditions create too much drag, he parks the truck. And he keeps the rpm near 2,000 whenever he can while generally staying between 60 and 62 mph. Mueller said he also maintains the truck properly. He has had the oil changed more than 100 times and the tires have been replaced 10 times. An office on wheels Mueller said another reason he has been able to log more than 1 million miles on his truck is because of its comfort level. His truck features cloth seats along with the XLT package that includes power seats, windows and mirrors. “I wouldn’t have been able to put so many miles on it if I was uncomfortable,” Mueller said. Scott said other pickup trucks oftentimes force buyers to choose between capability and refinement. He said Mueller’s truck is an example of how Ford F-Series has been a leader in allowing customers to avoid this compromise and enjoy both class-leading capability and comfort. “For people like Mueller, their trucks are their office. They spend hours and hours in their trucks, so we designed and engineered our truck interiors with that in mind,” said Scott. Considering the Super Duty’s combination of comfort and fuel efficiency, and the way Mueller knows exactly how his truck will respond to certain conditions and driving actions, he said he hopes to continue his sightseeing while delivering those big RVs throughout the U.S. and Canada.